This is for exporting the settings, I forgot to add the description to the help files. I just added the info. 0.9.22 is now available on Google Play. Hi Volker, I enter the credentials into the HPV login dialog. HPV does not store the credentials, it only passes them to the HttpAuthHandler. This is a google class that should store the credentials for further use and reuse them on subsequent auth requests. Saved passwords can be cleared by using the context menu. How can i ensure they are saved? You can’t. Are you asked every time for your credentials or only after a while/restart? Are the host and realm the same every time? Most likely the credentials are only stored for the runtime of the application. I could additionally store the credentials across app restarts, but I would have to investigate on how to do this securely. 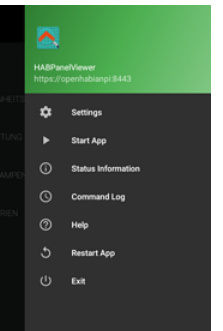 After installing various updates to my openHAB 2.3 installation everything works again without problems on my old Android 4.x tablet. So after all the discussion above it was not the webviewer component of the android device (I did not change the tablet at all). It happened after an update and disappeared a few months after another update. Makes me wonder about the quality of the openHAB code, because I use it in a few buildings with a lot of devices (WiFi, Z-Wave, Hue and so on) and I fear a complete shutdown because of such bugs in the future. Maybe openHAB is not ready for serious and reliable building automation yet. I have not tried this as yet. But, will. One question though. You mention it is available in the Amazon app store. I installed on my Android 7.0 phone. But, when it found my server I selected the main OpenHAB url (I think port 8080??) and it shows the usual selection of openHAB urls, PaperUI, HABmin, etc. and HAPPanel. Swipe from the right side to the middle of the screen (as described in the intro). Thanks! Missed that completely when I read it before I installed. After that I didn’t refer to the original post. @dastrix80, I just submitted a new apk to the main branch that contains the ability to store passwords in a private database so they can be reused after app restart. See the first post for a link to the apk. Can you please test if this works for you as expected? Edit: if you are on 0.9.22 you can export the settings before uninstalling and import back after installing the apk. thank you for the fast turn around for this feature! Update was helpful for me. The app work correctly now. Hi Volker, just some long time usage info. Its fixed the issue just fine. I do however notice performance issues, the app is very slow to respond and move around inside. I’m using this on a Samsung Galax Note 8 - it’s a very powerful phone.